La mer stands at the centre of Debussy's achievement: described by the composer as 'a seascape without figures', it is arguably the greatest and most original French symphony. In this study La mer is considered in the context of Debussy's personal and musical development, and in the French musical renaissance in general, looking back to César Franck and forward to the orchestral Images and Jeux. The author uses new biographical information and a wide range of sources to reveal the period of La mer's composition as one of intense emotional turbulence. Detailed discussion of performance styles draws on current recordings, and two analytical chapters trace the growth of ideas through the work. 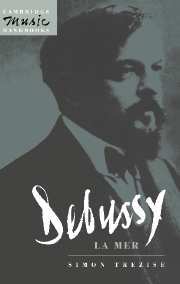 Studies of rhythm, motif and tonality show how Debussy generates 'narratives' across the three movements, which give La mer a structural integrity unparalleled in French music at the turn of the century.